“I can only tell you so much about this project but he (Robin) is very happy about this. He already said yes,” Ricketts told Manila Standard in an interview. The ‘90s action star is optimistic that action genre can make a comeback. The industry just needs a new breed of talents like FPJ’s Ang Probinsyano star Coco Martin who keeps the action genre alive, he said. '90s action star Ronnie Ricketts is making a big screen comeback via an action movie entitled 'Exit Point." 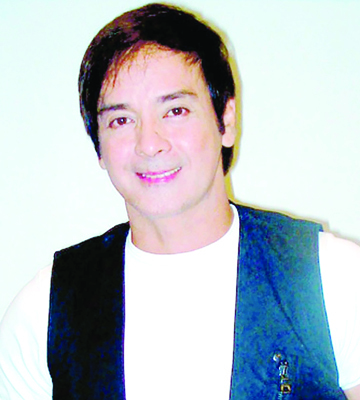 He believes that people would keep coming back to action movies if there will be more young stars like the Kapamilya primetime king who cares so much about developing stories where a protagonist is typically thrust into a series of challenges including multiple fight scenes, daring physical feats, and tense chases, ultimately creating a hero just like Cardo Dalisay. “But before it happens, actors should be physically capable to do the stunts. During our time, most action stars were martial artists and that gave an authentic flavor to the action scenes we were doing back then,” the action star pointed out. Ricketts is starring in a film called Exit Point, which marks his return to the action genre almost six years since he last appeared on the big screen. “The last film I did was in 2013, but it was an action comedy movie. This time, I really wanted to do a pure action movie just like the good old days,’ he shared. The film, which he co-produced with his wife Mariz, includes Australian model Natalia Moon, Nigerian-Jamaican football player Joachim Idinye, Korean race-car driver Sung Joon Park, actors Rey Bejar, Luigi Fernando, Bill Toledo, and Jayson Garcia in the cast. Also in the movie are Jackielou Blanco, Renzo Cruz, Alvin Anson, Mandy Ochoa, Brandon Ricketts, Mister International 2014 and police officer Neil Perez, Jerico Estregan, Edgar Mande, and Ronnie and Mariz’s youngest daughter, Raechelle. 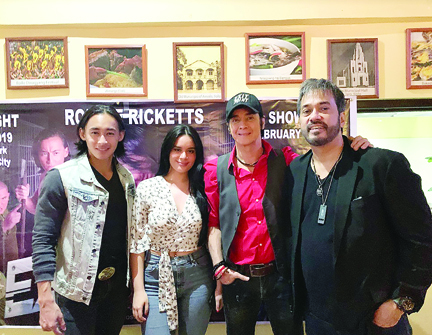 Ricketts with actors Jerico Estregan (leftmost) and Alvin Anson, and daughter Raechelle (second from left) who is also part of the movie. “We basically have an action movie that can be screened overseas. You’ll see in the trailer that we shot in different locations, in provinces, in a forest, because we wanted to have an action film that’s different from the usual movies that we see these days that concentrate in the metropolis,” Ricketts said. According to the actor, there have been negotiations with a foreign distributor to release the movie abroad. “We are confident that the movie has an international appeal. In fact, our cast includes foreign actors,” he asserted. Exit Point, which script was polished for almost a year according to Ricketts, is about 12 interesting characters chosen to be part of an illegal activity of a correctional facility. They are taken to an isolated island where they must fight for survival. “It’s like Hunger Games where they must do everything including killing each other in a race for freedom…but with Filipino twists,” Ricketts explained. Exit Point unspools in the cinemas on Feb. 20. The Cinema Evaluation Board members gave Elise, the Janine Gutierrez and Enchong Dee starrer movie, an A. And it’s easy to understand why. A PLEASANT MOVIE. 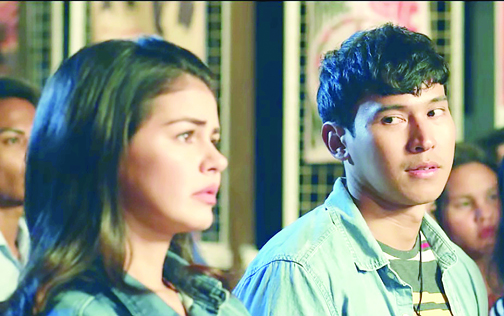 Janine Gutierrez and Enchong Dee in the Graded A romantic comedy-drama, 'Elise,' which is also based on real-life events. The Regal Entertainment movie has all the elements of a romcom but it has all the necessary emotions enough to get you intrigued. With a toned down drama and an interesting reference to an unforgettable young romance, Elise is so strong in giving you lessons on affirming love. The actors are perfect characters making the audience relate to being love struck to serious love which makes it relatable to everyone. The director calls Elise an ode to those who love and want to move on with their lives in the series of events that unfold. It is a movie that starts in light comedy and eventually progress to heart-tugging moments. Told in the eyes of Bert, the movie is pretty nostalgic because of the vivid and nice shots set in the 1980s. Watching the movie is like a blast from the past and is highly relatable because it tackles about the colorful life of the youth, not to mention that it’s inspired by a true story.